We have just been informed by our colleagues over at The Fireplace Megastore that they have just had the Apex Samson Balanced Flue Gas Fire installed and put onto display. This means you can see the build quality and feel the heat generated by this incredibly popular balanced flue gas fire. The Apex Samson balanced flue gas fire is ideal for properties without a chimney, these fires flue directly through the external wall and are incredibly efficient. With the Samson boasting an 85% efficiency rating, which is highly impressive considering the other option for a similar fire would be a powerflue gas fire, with even the most efficient of these only generating 69% efficiency, a near 20% improvement and unlike a powered flue fire there is no noisy extractor fan on the outside wall and no possibility of drafts during cold or windy weather conditions. The Samson is highly flexible with the choice of six different trims, driftwood, coal or pebble fuel effect and nine different frets to choose from, meaning the fire has the flexibility to be either contemporary silver or very traditional in brass with an indiana fret. 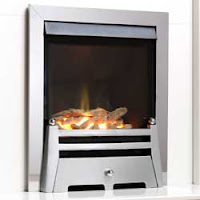 The fire is on display is proudly displayed with the polished stainless steel trim and the Chrome Washington Fret and fully functioning allowing you to see the living flame effect in action with the coal fuel effect. The Apex Samson is displayed prominently in one of their best selling natural limestone surrounds, The Europa Crete Limestone surround is made of real portuguese limestone giving that authentic cool to the touch feel that is unmatched by more modern synthetic or micro marble fireplace surrounds. 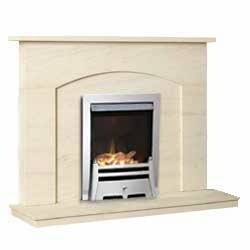 Comes with 51inch top shelf and features a gentle curve to the mantle shelf to add to the classic styling. This high quality stone fireplace comes with a three-piece back panel for ease of handling and installation. It also has the added bonus of free mainland UK delivery! Visit the Fireplace Megastore HERE and view this high-quality balanced flue gas fire.